They do things a little differently for Thanksgiving in the Barrera household, and at Murray’s we support that. After all, what is Thanksgiving about if not family tradition and indulgence in delicious food? 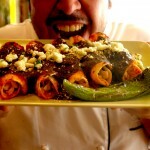 We would certainly be thankful to be served these enchiladas any day of the year. In a saucepot, bring to a boil 2qts of water, the chopped carrots, celery, onion, bay leaf & 1½ Table spoons of salt. Add the chicken breast and cook until still slightly pink in the center, think “mid-rare”. In a smaller saucepan heat 2 tablespoons of olive oil over medium flame & add the small diced onion & minced garlic. Cook for about 4 minutes allowing to brown only very slightly. Add the minced chipotle & smooshed can tomatoes along with some juice from the tomatoes. Season to taste with salt and fresh cracked black pepper. Reduce heat to low & allow to slowly cook until the chicken breast is finished cooking in the other pot. Remove the vegetables & the breast from cooking liquid and set aside 1 cup of the remaining chicken flavored broth. Carefully hand shred the hot chicken breast into long thick strips. Evenly divide the shredded chicken amongst the 6 corn tortillas. Sprinkle a generous amount of the Maple Leaf Jalapeno Jack cheese over the chicken. Remove the tomato sauce from the stove & pour ½ of the sauce into an oven safe baking pan. Roll the tortillas into “flute” shapes and place flap side down into the tomato sauce lined dish. Pour the remaining tomato sauce over the enchiladas and place into preheated oven for 8 minutes. In a small saucepan, bring to a boil, 1 cup of the reserved chicken broth. Add ½ cup mole base & stir until the mole is thoroughly dissolved & has the consistency of melted chocolate. Carefully remove the enchiladas from the oven and transfer to plates. 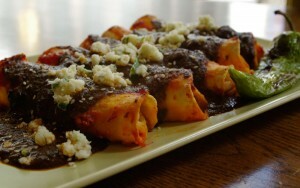 Pour your desired amount of mole sauce over the enchiladas and crumble Cojita cheese over the top.